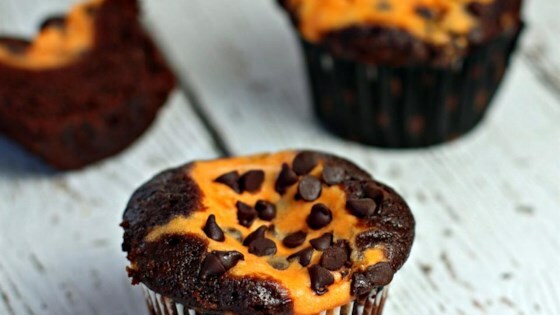 "Chocolate cupcakes with pumpkin cheesecake filling are a delicious combination of rich, moist chocolate cake and a creamy pumpkin smoothness inside." Place cream cheese, 1/3 cup sugar, egg, pumpkin, yellow food coloring, red food coloring, and salt in a bowl. Beat using an electric mixer until thoroughly combined and no lumps remain. Stir in chocolate chips. Whisk flour, 1 cup sugar, cocoa powder, baking soda, and 1/2 teaspoon salt together in a large bowl. Mix in water, oil, vinegar, and vanilla extract until batter is well blended. Fill muffin cups 1/2-full with batter; top with 1 tablespoon of the cream cheese mixture. Sprinkle a few chocolate chips on top. Yes, some had peanut butter icing with candies.